"Delicious, bite-sized party appetizers that can be made a day ahead and served cold. Easy to make and go in a flash. I made the puffs in the shape of footballs for a Super Bowl party." Mix together the corned beef, onion, mustard, mayonnaise, and horseradish. Cover and refrigerate. In a large pot, bring beer and butter to a rolling boil. Stir in flour and salt until the mixture forms a ball. Transfer the dough to a large mixing bowl. Using a wooden spoon or stand mixer, beat in the eggs one at a time, mixing well after each. Drop by teaspoonfuls onto a lightly greased baking sheet. Bake for 10 minutes in the preheated oven. Reduce temperature to 350 degrees F (175 degrees C) and bake an additional 10 minutes until golden brown. Centers should be dry. 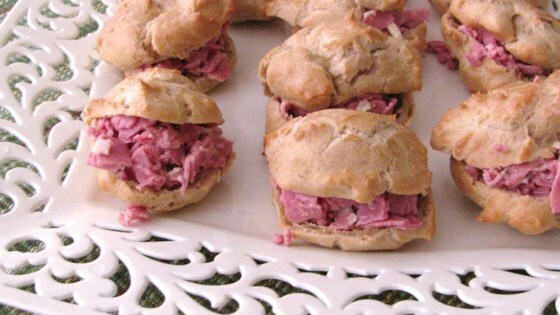 When the shells are cool, split the puffs and fill with the corned beef mixture. Refrigerate until ready to serve.